KommerceServer is mobile ready out-of-the-box and included as part of the eCommerce Suite. The responsive web design of KommerceServer provides an easy to implement, feature-rich and cost-effective mobile eCommerce solution. 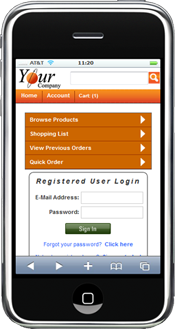 The mobile eCommerce storefront and customer web portal solution provides an optimized user interface and workflow that automatically adapts to each mobile device to meet the needs of manufacturers, distributors and retailers. KommerceServer Mobile is a perfect complement to your corporate website and enables you to put the full power of the KommerceServer webStoreFront and webPortal in the hands of your customers, partners, and even internal users so that they can connect with your corporate website from anywhere using their favorite mobile device. 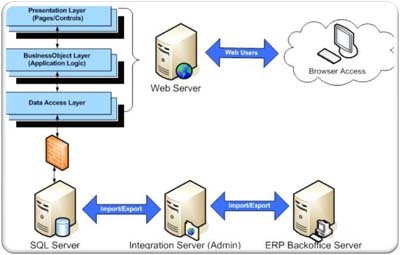 KommerceServer Mobile provides all the power of KommerceServer webStoreFront and webPortal in a compact, mobile ready solution. 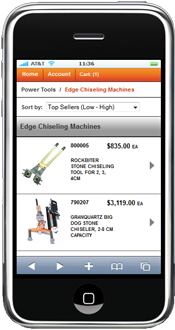 Your customers can browse your web catalog, make online purchases and access their account history using a streamlined interface that adapts to their mobile device in order to support the requirements and workflow of the mobile user. KommerceServer Mobile is different from native mobile applications because it does not require a separate version for each mobile platform. Instead, KommerceServer Mobile uses responsive web design that looks similar to a native mobile application, but automatically adapts to each mobile device so that it works the same across all mobile platforms without additional development effort. The result is a mobile website that is easier for your customer to use and also easier to deploy, support and customize.This provides a lower total cost of ownership. KommerceServer Mobile is very easy for your customers to use. Regardless of what device they are using (PC, laptop, or a mobile device), they can easily peruse your corporate website, browse and search your product catalog, place and review orders. This is possible because the KommerceServer engine automatically adapts the look and feel of the website, storefront and portal to each device. So your customers using their favorite mobile device will have a more streamlined, compact view of the website yet they will still have all the tools they need at their disposal to do business with you. KommerceServer Mobile is a fully optimized, responsive website that works for all mobile devices out-of-the-box, yet it can be easily customized if needed. The KommerceServer Mobile solutions are designed to expedite your implementation and minimize costs. The solution pricing includes all the software and services needed for a complete mobile eCommerce Solution. Mobile webStoreFront and Web portal solutions that extend your enterprise over the Internet, allowing you to connect with customers, collaborate with partners, and compete more effectively in the global market! KommerceServer Mobile eCommerce: Exceptional mobile eCommerce software that is feature rich, easy to implement, and cost-effective. So what are you waiting for?